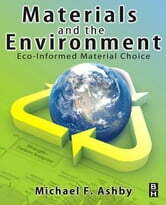 Materials and the Environment is the first book devoted solely to the environmental aspects of materials and their selection, production, use and disposal. Written by Mike Ashby, one of the world's foremost materials authorities, the book introduces methods and tools for thinking about and designing with materials within the context of their role in products and the environmental consequences. The tools developed in the text are implemented in the CES EduPack Eco Design Edition software and new Eco Audit Tool available from Granta Design. 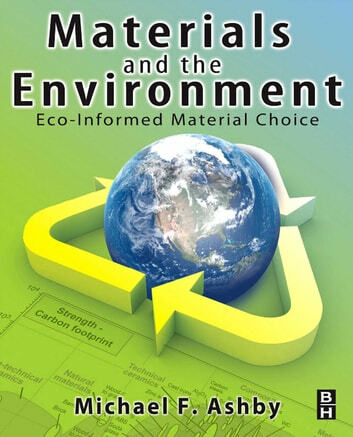 The book provides in-depth coverage of such topics as material consumption and its drivers; the material lifecycle; eco-informed material selection; renewable materials and sustainability; legislative and regulatory aspects; and eco-profiles of more than 40 widely used materials. It contains numerous case studies showing how the methods discussed in the book can be applied to real-world situations. It includes full-color data-sheets for many of the most commonly used materials, featuring such environmentally relevant information as their annual production and reserves, embodied energy and process energies, carbon footprints, and recycling data. This book will appeal to instructors of materials science and selection courses, as well as to instructors of industrial and product design courses; students of engineering, materials science and industrial/product design; materials and industrial engineers; and product designers. * The first book devoted solely to the environmental aspects of materials and their selection, production, use and disposal, by noted materials authority Mike Ashby. * Introduces methods and tools for thinking about and designing with materials within the context of their role in products and the environmental consequences. * Contains numerous case studies showing how the methods discussed in the book can be applied to real-world situations. * Includes full-color data-sheets for 60 of the most widely used materials, featuring such environmentally relevant information as their annual production and reserves, embodied energy and process energies, carbon footprints, and recycling data. * The tools developed in the text are implemented in the CES EduPack Eco Design Edition software and new Eco Audit Tool available from Granta Design.